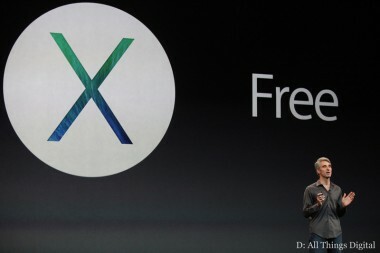 For Apple, offering its new OS X Mavericks operating system to Mac users for free isn’t a new idea, but a return to an old one. Back in the day, the company regularly issued OS updates at no charge, allowing them to be freely redistributed. Apple ended that practice in 1997 with the launch of Mac OS 8. * Now, some 16 years later, it is embracing it again, and for a very good, very simple reason. So, Apple wants its Mac customers — all of them — to have its latest desktop operating system. And it wants this not so much because it’s good for consumers — though obviously it is — but because it’s good for Apple. Indeed, offering Mavericks for free gives the company a host of benefits and competitive advantages that likely made forgoing whatever money it might have made by charging for the OS relatively easy. Releasing Mavericks for free generates immediate customer goodwill; Apple is now giving away to Mac owners the software for which it once charged. And, if that experience is fantastic enough, people will pay a premium for it. Which is really the whole point of Apple’s return to this free-pricing strategy. Because ultimately what the company is doing here is using software as a means to sell premium hardware. This is precisely what we’ve seen with iOS. Indeed, in taking Mavericks free, Apple is really just mirroring the strategy it has long used for its mobile OS. Free with device; free immediate upgrades. Software becomes a differentiating factor for hardware that often commands prices higher than those of the competition. So, too, does the promise of free updates in the future. Buy into the Mac ecosystem now and, as Cook said, you will always have access to Apple’s best features. And that’s increasingly important these days, when other big players like Google are offering their software gratis.